Here is the list of Best Free Red Eye Remover Software For Windows. These software let you remove red eye from photos completely that occur due to use of flash during photography. Some of these software provide automatic red eye removal option, some provide manual process for red eye removal, and some have both manual as well as automatic modes. The automatic red eye removal process detects red eyes and removes red color with just a single click. When it comes to manual red eye reduction, various software provide different tools to fix red eye from photos. The manual process includes selection of area on photo with red eye or simply applying red eye removal brush on the eye’s pupil by zooming in to the eyes. You can also control various threshold values as well to get desired result. The automatic red eye remover tools have an advantage that they fix all the red eyes at a time (in most of the cases), but in manual process, you will have to select one eye at a time and remove red color. Some of the software mentioned here are dedicated red eye remover, while others are photo editors with red eye remover. Go through the following list to find out brief review about the red eye remover tools of the mentioned software. You will also know how to remove red eye from photos using these software. I like S10 RedEyes the most. Why? Because it lets you perfectly select the pupil with the help of circular selection tool, which can be shaped into ellipse. This prevents you from selecting skin above or below pupil, and removes red color just from eye’s pupil. Also, there is an option to colorize pupil into four different colors. Its an amazing free software to remove red eye. You can also checkout the list of best free Lens Distortion Correction Software, Photo Noise Reduction Software, and Tilt Shift Software. S10 RedEyes is a dedicated software to remove red eyes from photos. It has many advanced red eye removal options, such as: Change eye color, Pupil Brightness, and change Eye Brightness. You can only remove red eye from one eye at a time. When you load a picture on this software, you have to click on the eye’s pupil with red eye. A new window will open with a zoomed in picture of eye (as displayed in the above picture). Now you have to drag the mouse on the pupil to select just the pupil. In case the selection tool is capturing eyelids or other surrounding skin, you can use the -/+ keys to make the selection elliptical. When you have selected the area to remove red color, click on the option Fix Red Eye. In case, you have made wrong selection, you can cancel the selection. For the selected pupil, you can increase/decrease Eye brightness and Pupil brightness. The most interesting part of this software is that it lets you choose from different eye colors, such as: Gray, Blue, Brown, and Green. Save the changes applied, then move on to another pupil and repeat the same process. Apart from red eye reduction, you can carry out very basic image editing, such as crop, tilt, and brightness/contrast adjustment. Vicman’s Red Eye Remover is a simple yet amazing tool to remove red eye from photos. Being a dedicated Red Eye Remover software, I thought that it would be a complex software with some advanced features, but it turned out to be a really simple one. The only task it carries out is Red eye removal. How does it works? Simply load your photo here, zoom in to the eye with Red spot, then drag the cursor and select the spot. The Red eye will be gone from your photo. Repeat the process to remove red eye caused by flash, by simply selecting the spots with red eye. The result produced by this software was satisfactory. In case you are not satisfied by the result it produces, you can adjust the Pupil Detection and Correction Strength sliders. An option also let you select if you want to darken eyes after red eye removal. Save your photo in JPEG format after applying changes. You can also select the output picture quality. Paint.Net is a very popular image editing software for Windows. It has numerous tools to add effects, edit, and manipulate photos. One of the tools available here is Red Eye Remover. It lets you significantly bring down the level of red eyes in a picture. Apart from the default tool, there are various Paint.Net red eye remover plugins available. Lets get to know all of them one at a time. For red eye removal using the default tool, open a photo in Paint.Net, then using any of the selection tools, select the region around eye’s pupil. When selected, go to Effects>Photo>Red Eye Removal. A floating toolbox will appear, where you will have to adjust the red eye remover strength using a slider. You can preview changes on the main photo as you adjust the slider. Click OK when satisfied with the result. The red eye removal was okay with Paint.Net, but not as significant as Vicman’s Red Eye Remover. Make sure you select the region around the Eyes’ pupil before using this tool, else you will end up neutralizing all the red colors on the photo. You can apply changes on multiple selections at a time; simply press and hold the Ctrl key while selection. This red eye reduction plugin for Paint.Net does the job which Paint.Net’s default tool to fix red eye could not do properly. The default tool leaves little hints of red color during the process, but this tool takes care of the red color completely. The process to remove red eye using this plugin is same as the default tool. To install this plugin on Paint.Net, simply copy the downloaded file and paste it in the Plugin Folder of Paint.Net. The Plugin folder is located at: C:/Program Files/paint.net/Effects… Once you have pasted the plugin, start Paint.Net or restart if already open. You can use this process to install any kind of plugin in Paint.Net. To remove red eye using this plugin, open your image, and use selection tool to select the pupil of eye. Now go to Effects>Photo> Red Eye Quick Fix. A window with slider appears, where you can control the threshold of this effect according to your image. Save photo when done. Download Red Eye Quick Fix Plugin. Eyeshine Removal is a plugin for Paint.net to remove shiny eye effect in photos of animals’ eyes because of flash. The process to remove shiny eyes from photos of animals is a bit different, as the color produced due to flash is not red for them. Usually, the red eye remover programs are designed to remove red color only, that’s why we need this plugin. Here in the above screenshot, I have tried to fix just one shiny eye of the dog’s photo. Once you have installed this plugin, load your photo on Paint.Net. Now select the eye using selection tool. Go to Effects>Photo>Eyeshine Removal, a new window will open. You have to select the color of eye shine, black level, white level, and smoothing. You can adjust the sliders till you get satisfactory result. Once done, save your photo. Visions is a free photo viewer and editor for Windows. Its known for its 3D image viewer style and a good set of image editing tools. The Red Eye Removal tool is available in the Editing Room tab of this software. Load a photo in Editing Room, then select the Fixes option, where you will find the option to Remove Red Eye. Select the tool, then use rectangular or circular selection tool to select the area around eye’s pupil. The selection tools are available at the bottom of the interface, right below the area where the photo loads. You can only select one pupil to reduce red eye at a time. You can adjust the Sensitivity and Saturation sliders according to your need; however, the default setting works well to get rid of red eye. Be careful about the selection, else the tool de-saturates the skin as well if included in selection. When done, save your photo. You can also apply various other effects and filters to your photos here. Pixlr is a free desktop image editing software where you can apply numerous effects and edits to your photos. It has a free as well as a pro version; the free version is almost as good as the pro version with basic image editing tools, filters, and stickers. One of the free tools that Pixlr provides is the Red Eye Reduction tool. The tool to remove red eye is pretty simple, and easily lets you remove red eyes caused by flash. You will have to sign up on its website for free to be able to download this software. Once downloaded, you can load your photo here to remove red eyes. Once you load your photo, click on the Fast tool set, then click on red eye option. Now, all you have to do is click in the center of an eye to completely get red of the red color. Its as simple as that, no selection required. In case you are not getting a desired result, you can tweak the Tolerance slider, which appears when you open the red eye tool. You can additionally apply various other effects, edit your photo, and apply filters if you want before saving your photo. Social media photo sharing options are available as well to share photos directly on Facebook and Twitter. Image Analyzer lets you edit images with basic image editing tools with layer support. It has a vast set of tools, including Red Eye Remover, and this list can be expanded by using different plugins that are available for this software. The red eye reduction tool lets you get rid of red eyes, one at a time. Open a picture, use the selection tool to select the area around eye’s pupil, then go to Operations> Color Correction> Red Eye Removal. This removes the presence of red color in the selected area drastically. Repeat the same process to remove red color from other eyes. Save your image once you have removed all the red eyes. There aren’t any complex or adjustment options for the red eye tool. Use this software to make use of various other interesting image editing tools, noise reduction tool, histogram, etc. digiKam is an advanced image processor, where you can carry out image editing, batch processing, image export, and view images as slideshow. The image editor of this software has an automatic red eye reduction tool. This tool automatically detects eyes, detects if the eyes have red color, then carries out red eye reduction on a photo. Browse and open a photo in digiKam’s photo editor. Go to Enhance>Red Eye. The algorithm of this software carries out red eye reduction automatically, and presents a photo without red eye. A slider bar lets you set Red Level if you are not satisfied with result. You can view the comparison of before and after photos in various modes, such as: horizontal split, vertical split, preview on mouse over, etc. Numerous other options let you add effects, decorations, adjustments, and filters to your photos. I would love to use this software, but its a bit laggy. PhotoScape is another free image editing software for Windows with red eye remover tool. It has automatic red eye reduction option, and all you have to do is simply select the area around red eye to remove it. Once you open your photo in PhotoScape, go to the Tools tab, which is available at the bottom of the interface. Now select the Red Eye Correction option. An instruction appears, which asks you to drag a small box around each eye to remove red color. As soon as you select the area, the red eye will be gone. Its as simple as that. There are no other adjustable options, which I think you may not require, as PhotoScape removes red eyes satisfactorily. Other tools that you can make use of for photo editing include: Mole Removal, Mosaic, Paint Brush, Clone Stamp, Crop, Object Tools, and Image Adjustments. GIMP is a well known open source image editor, which provides Red Eye Remover tool. To remove red eye using GIMP, you will have to use a selection tool to select the area of pupil with red color. Once selected, go to Filters>Enhance>Red Eye Reduction. This tool removes the red color from eye automatically. A floating window also appears, where you can change threshold, in case you did not get satisfactory result. Save your result once done. There are various other editing tools, filters, and effects that you can use to manipulate photos using GIMP. Photo Pos Pro is a professional image editing software with automatic as well as manual red eye removal tool. The automatic mode does not removes red eye properly, but the manual mode lets you completely get rid of red eyes. You can only remove red eye from one eye at a time. Before using the tool, make sure you have selected the pupil area of eye. Now Go to Filter> Red Eye Reduction. You can either use the auto or manual mode. Check if the auto mode works for you, if not, go to Manual red eye reduction mode. Manual mode lets you adjust the values of Level, Tint threshold, Saturation threshold, and Luminance threshold. More advanced options also let you manage opacity and blending mode of the red eye remover effect. You can carry out various other simple as well as complex photo edits using this free tool. Picasa is a discontinued image editing product from Google, but is still available for download from various download sources. Picasa has auto red eye reduction tool, which detects red eyes automatically and corrects them. This means, you do not have to select the area around red eye manually. You will not find any other tweaking options. In case, an eye is not selected, you can drag your cursor across the eye’s pupil. Automatic or Manual red eye selections can be deleted as well. Picasa is a fun to use image editor, and you must try it. Pinta is an open source photo processor for Windows, Mac, and Linux. It lets you remove red eyes from photos and works the same as Paint.Net. You have to select the area around the eye’s pupils, then open the red eye remover tool. Go to Filters>Photo>Red Eye Removal to access the red eye tool. Tolerance and Saturation percentage can be adjusted to get a desired result. Pinta is a good image editor and has various other tools to manipulate images or draw on photos. IrfanView is a free image viewer which has evolved to be an image editor too. You can carry out simple, as well as advanced photo editing tasks, which include Removing Red Eye from photos. The tool to do so is pretty simple, and works effectively. Open a photo in IrfanView, then while editing the photo, go to Image> Red Eye Selection. Before you apply the remover, you will have to select the area around red eye using the selection tool. When you have removed red color from one eye, repeat the same process for other eye(s). No adjustable options are available or required to remove red eye in IrfanView. 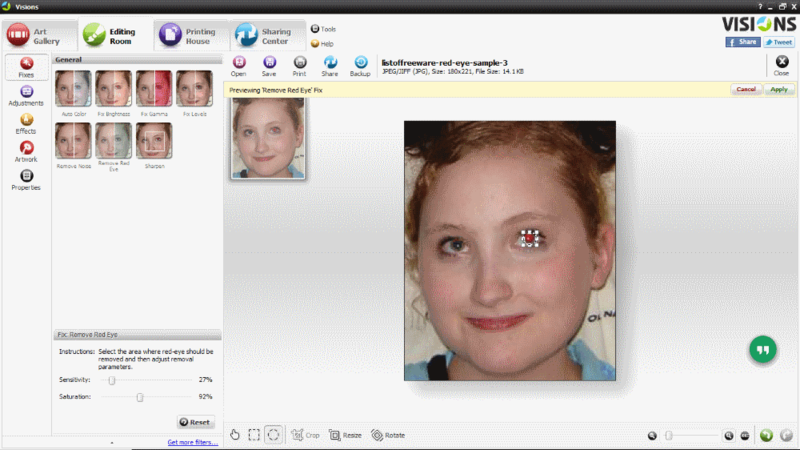 FastStone Image Viewer is another good image processing software for red eye removal. It is primarily an image viewer, but also has image editing capabilities. To carry out red eye removal here, open the photo, then go to Edit> Red Eye Removal. This opens up a new window with the image, where you have to use the selection tool to select the area on photo with red eye. Once you have made your selection, double click on the selection to get rid of the red eye. Repeat the process for other eyes if they have red color. You can make use of various other image editing tools as well. FastStone image viewer is free for personal use only. VirtualStudio being an image editor, lets you remove red eyes from photos pretty easily. All you have to do is use the selection tool to select the area around the pupil of red eye, then apply the red eye removal tool. There are no adjustable options and the red eye is removed instantaneously. After you have loaded your photo here and made eye selection, go to Adjust> RedEye Remove. There are several other image processing tools available here that you might want to use. Fotor provides photo editing software for Windows with Red Eye Reduction tool. You will also find various image adjustment tools and photo filters here to apply on your photos. The Red Eye Remover tool in Fotor is available in the Adjust Tab, and known as Red Eye Tool. To use it, you will have to adjust the Red Eye Remover Brush size according to the size of Pupil. After that, simply click on the red eye portion of photo, and it automatically remove the red color. You can save your photo to your computer and even share it directly on Facebook, Twitter, or Flickr. PhoXo has photo editing options with layer support, and lets you remove red eye from photos easily. The red eye removal tool is available right on the tool panel (checkout the above screenshot). Clicking on this tool provides a red eye remover brush, which you have to apply on the red eye to fix it. The brush size and strength can be increased or decreased. I found this tool to fix red eye pretty satisfactory, as you can adjust the size and strength of red eye remover brush according to the size of pupil and the amount of red color. Various other image manipulation tools are also available here, and its a fun to use software. Sharp Shot lets you fix red eye and carry out numerous other image edits and adjustments. Its a simple image editor and removing red eye here is very easy. Load a picture, then go to Tools> Red Eye. A new window appears with the tools to fix red eye and a preview of the image. Simply click on the red eye to eliminate the red color. You can also adjust the threshold of effect to get desired output. Its a multi platform red eye remover and works with Windows, Linux, and Mac.